Thanks for sticking with me through my absence this week. I'm settled back into town, and I'm back with another review. With summer approaching, this review came in the nick of time! I like to switch my lotions and scents as the seasons change. 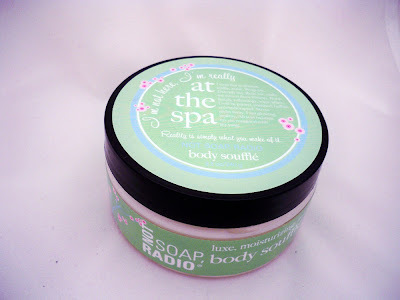 This time around, I had the opportunity to try out some products from a line called Not Soap Radio. The line was developed buy two sisters who started this line as a hobby and it turned into an amazing full-fledged beauty and bath company. To see my review, click here! I was sent the collection called, "I'm not here I'm really at the Spa." The set consists of Dry Oil Spray, Body Souffle, and Sugarded body polish. The three actually work really well together. They all share a similar scent theme which is a mix of lavender infused with apricot, lyacinth, peony, and the smallest note of eucalyptus. I recommend starting with the Sugared Body Polish. This is an exfoliator which is a must-have for every shower arsenal. Exfoliating your body on a regular basis will keep your skin soft and streak-free if you're a self-tanner like me. It's also great to use before shaving. I really like the consistency. You get a lot of exfoliating Cranberry Seeds without excess oil floating around. It also smells like you stepped inside a pastry shop, yum! After showering, I recommend following up with the Body Souffle. 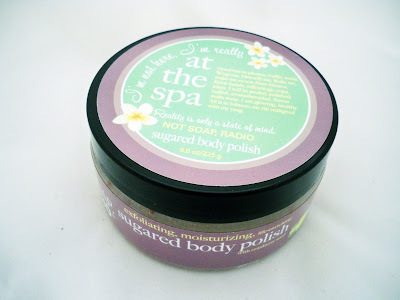 This is a thick, moisturizing cream for the body...some like to call them body butters. Use it as soon as you get out of the shower to lock in the moisture. It's also great as a hand cream. As soon as I applied it, I noticed that it is thick and moisturizing. Your hands do get a bit of greasy residue. For some reason though, this was my least favorite scent of the three. Not exactly bad, just not my favorite. This little bottle is truly a multi-tasker. You can use it as a moisturizing tool, a body splash or even a room spray. 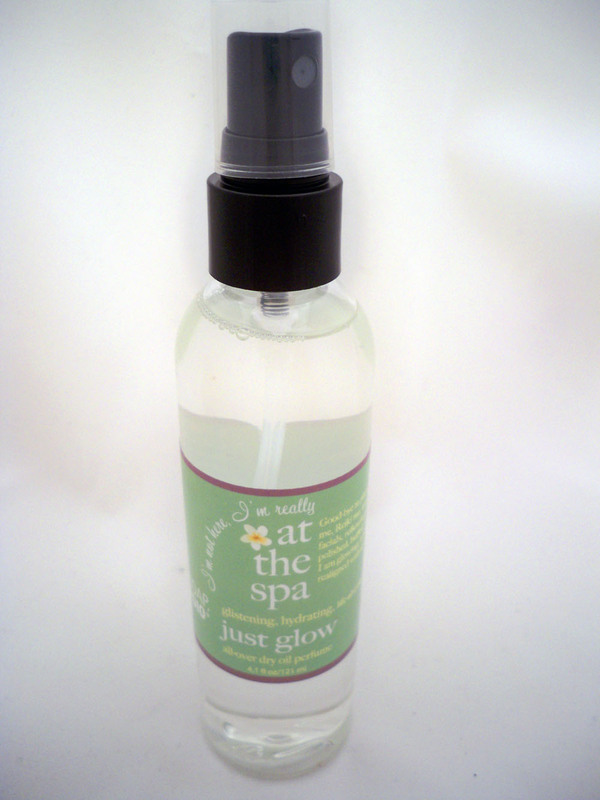 I think this is great for summer when you need a light coat of moisture. The consistency is a really nice dry oil so you don't get any greasy residue or messiness. I like to use it for a quick sheen to the legs before going out. It was actually really nice to try out these products...it definitely felt like a pampering, spa experience. The products were all packaged nicely and the themes are too cute. I don't pamper myself enough when it comes to these kind of things. My favorites were definitely the sugared body polish and the dry oil spray. If you love both products I would definitely recommend this line...they have a lot of different other scents and sets to try. Apparently, the line is also Greek Approved...so if you're looking for a gift for your big or little sorority sisters out there, definitely check them out. FTC Disclosure: Products sent for review by company. I am not affiliated with the company and not paid to write this review. These are my honest thoughts and opinions. Hey hun, just wanted to let you know - if you wanna join in.. i've given you and your awesome blog an award! Sedona Lace 88 Metal Palette Look & GIveaway! Guess What Shadows I'm Wearing? Insider Info! Eve Pearl Huge Discounts! 2010 LA IMATS Experience - Vid and Pics! 2010 IMATS Pasadena Huge Haul!